Recently, new member Beckamojo over on the Mellow Bakers enquired about getting a white sandwich bread recipe to use in her 13 in x 5 in x 5 in Pullman pan. She was having a few issues with her trials at making a Pain de Mie from a US (cups-based) recipe including not knowing how much dough she needed for her large Pullman. Jacqueline, another Mellow Baker, asked if Becka had digital scales so she could be more precise than her original use of cups for measuring. We would also need to look at proofing times and make sure her process didn’t end up with over-proofed dough. 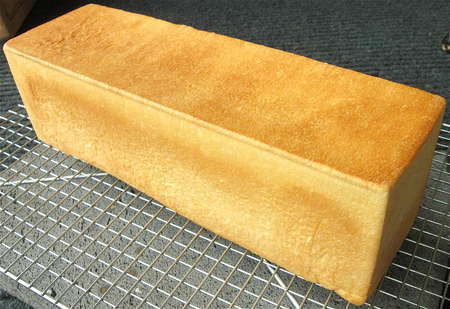 Check the King Arthur recipe for a Pain de Mie which is suitable for a 13 x 4 x 4 pan. It is a bit smaller than your 13 x 5 x 5 pan so you’ll want to increase the amounts which are, fortunately, given in weights as well as volume. With luck, they will someday upgrade to include grams, in spite of the general American public’s dogged resistance to embracing the so-much-simpler metric system. Let’s have a peek and break it down here so you can see what is going on. 5 3/8 oz. Ugh, fractions in odd numbers. 3 ÷ 8 = 0.375. Let’s round it up and go with .4 then. Teaspoons… let’s leave those for a bit. A “packet” of yeast contains anywhere from 6 to 17 grams, depending on location and manufacturer: they’re all over the darned map. Instead, go by the general rule that you use 1% of the FLOUR WEIGHT in Instant Dry Yeast and you should be good. Here, the flour weight is 567g, so 6g is ~1%. If you were to use ACTIVE Dry Yeast, you’d want to use 1.5% instead. Instant Dry is better. Since this amount is for a 13 x 4 x 4 pan, we need an extra inch to fill your 13 x 5 x 5 or increase the amount by 56.25%. NOTE: I had originally miscalculated the new percentage as 125% which accounted for a pan size of 4 x 4 increased to 4 X 5. However, sharp reader Erica (see comments bellow) caught the mistake. We need to calculate an increase from a 4 x 4 pan to 5 x 5 which is 56.25% more. Now, you can follow the directions given on the King Arthur page and have the right quantity of dough for your Pullman pan based on their recipe. Use either the hand or mixer method (if you have one) the bread machine is probably not big enough to take all that dough. • After your bulk proofing (the first one), divide the dough evenly into 5 pieces (1803 ÷ 5 = 360g each). Roll each into a ball and let them rest for at least 15 minutes under cling film. • Flatten each piece into a rectangle. Roll up into a log about 5″ wide. • Oil or spray the walls and the lid. Place the 5 dough logs evenly in the pan. Let it rise again until the dough is 90% from the top of the pan, about 30-40 minutes (depending on how warm your kitchen is). This not only gives a pretty loaf, you can then split the loaf in sections and freeze what you won’t use for a while. This is handy for a very large pan like yours. • scaled it up to 156% to suit your larger pan. 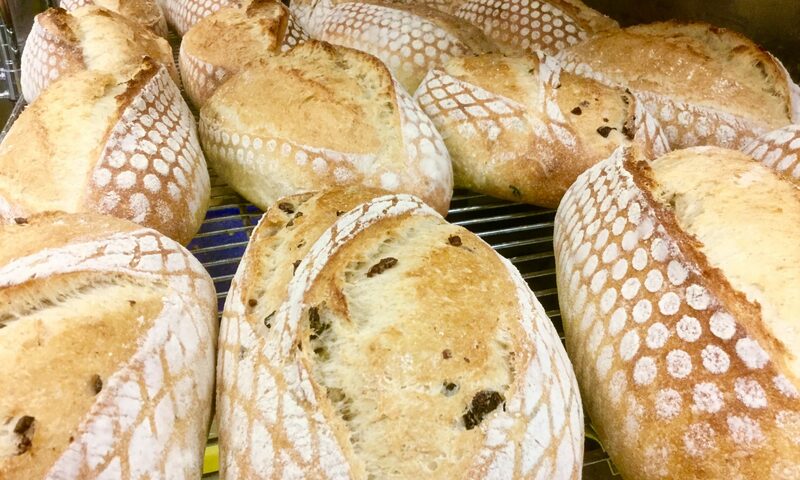 All that’s left now is for you to give it a go and see if you like the resulting bread! If you do and the size is good, you now know you need a recipe that will give about 1450 grams of dough. Found a Challah bread recipe that gives you a 750g loaf? You can make that suit your pans easily. Now we will wait and see what Beckamojo makes of this information. My hope is that she, and other visitors to the site, can feel comfortable looking at a recipe and giving a whirl at modifying it to their needs. Hey, if I can do the math, most anyone can. And I’ll admit readily that math was my very worst subject in school. Questions or comments? Don’t be afraid to post them below! I recognize this is an older post and the person who requested the information has probably done with it already, but I was curious about your math. A 13x5x5 pan increases from a 13x4x4 pan in two dimensions, effectively 13×25 rather than 13×16. Wouldn’t you want to scale up to about 155%, given that extra dimension? Or did you account for only one of the two dimensions expecting flatter/shallower loaves, or an airier crumb? Thanks for your comment. You are indeed correct; I miscalculated and accounted for extra space in only one direction when there are two directions to fill. Given the length stays the same, we don’t need to worry about the 13″. That leaves us with a 4 X 4 dimension to start and a 5 X 5 as the goal. So 16 square inches should become 25, which is actually 156.25%, not 125% as I had written which calculated a new size of 4 x 5 (20 square inches) not the correct 5 x 5 (25 square inches). Good catch! I will update the post to clarify.